Elite anglers like Alton Jones, TV show hosts like Mark Zona and regular guys like Dave Krantz, an avid angler who posts of his trips on the Bass Fishing Home Page, all make journeys to the big bass mecca that is Falcon Lake. Considered the No. 1 largemouth lake in the nation, Falcon draws anglers because of the quantity and quality of fish, and many anglers leave having caught the biggest bass of their lives. In south Texas on the Mexican border, Falcon Lake’s 83,654 surface acres were created when the Rio Grande River was impounded in 1954. Texas began its stocking program there with 750,000 Florida strain fingerlings in 1975 and has since added 2.8 million along with more than 6,000 adult fish. In the past four years, Texas also has placed 35,000 fry from its Share Lunker Program in the reservoir. Despite pirate activity and a well-publicized murder of a jet skier, anglers just keep a coming. Krantz and his crew have visited Zapata, Texas, around February each year to take advantage of the spawn. Krantz reports that James Bendele of Falcon Tackle told him he’d sold fishing licenses to people from 37 different states in a seven-day period. Bendele also relates a story of anglers who didn’t buy $40 Mexican fishing licenses and had to pay $3,000 to get their boat back. After hearing that, Krantz said he and his buddies ponied up some sawbucks quicklike. On Jan. 7, 2011, Tommy Law caught the biggest reported largemouth from Falcon, a 15.63-pounder. 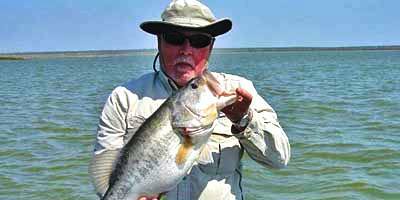 While that only ranks 36th on Texas’ Sharelunker Top 50 list – Barry St. Clair’s 18.18 from Lake Fork in 1992 leads -- seeing fishing reports where three men from Wisconsin all landed double-digit bass in one week gets Krantz and others excited to hit the road for two days to fish fabulous Falcon Lake.